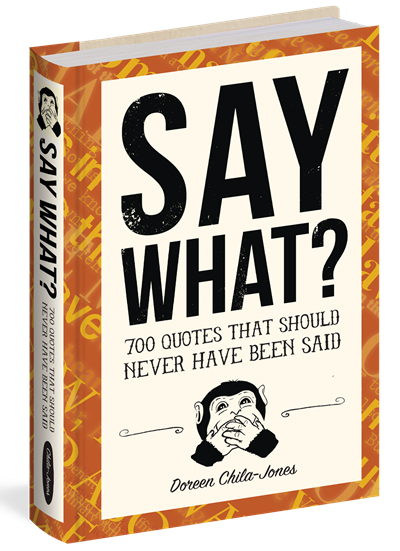 700 Quotes That Should Never Have Been Said, Doreen Chila-Jones, Punchline by duopress. It’s easy to describe “Say What?” It’s a collection of almost 700 statements—offered by politicians, world leaders, celebrities, athletes, etc.—that would have been better left unsaid. Some of the quotes probably qualify for inclusion in Failure’s collection of failure quotes; others are somewhat endearing, like the handful of entries that come courtesy of the late Yogi Berra. George W.’s wife Barbara also makes an appearance, courtesy of her infamous statement about the people who found shelter in sports arenas in the wake of Hurricane Katrina: “So many of the people in the arenas here were under-privileged anyway. This is working very well for them,” she said. Not surprisingly, many of the quotes can be chalked up to stupidity or ignorance. Consider President Donald Trump’s statement: “It’s freezing and snowing in New York—we need global warming!” And then there’s “The sun has been there for 500, 600 years,” which was uttered by former major league baseball player, Mike Cameron. Dark Star Safari—Overland from Cairo to Cape Town, Paul Theroux, Houghton Mifflin Company. The Official Movie Plot Generator—Over 27,000 movie plot combinations, Jason and Justin Heimberg, Brothers Heimberg. Check Yourself—The Checklist Manifesto: How To Get Things Right.